If you love good food, there’s no reason to spend the time and money flying to The Big Apple when The Little Appleof Manhattan, Kansas, so dubbed by a collaboration with Mayor Ed Koch and New York City, will do nicely for a prime slice of culinary heaven. The sleepy little Midwest town of Manhattan, Kansas has won many accolades over the years, including #1 Best Small Community in U.S. for Business and Careers (Forbes, 2011), K-State—One of America’s Best Colleges (Princeton Review,2011) and One of the Best Places to Live (CNNMoney.com, 2010). While Manhattan, Kansas hasn’t been known as a destination for cuisine aficionados, that may be changing due to an upsurge in economic growth and the addition of creative new eateries dotting the landscape. Here is a rundown of some of the best Manhattan has to offer. Let the calories begin! Located in downtown Manhattan on Poyntz Ave, Bourbon and Baker has only been open since November 2013. The entire space has been remodeled to reflect a clean, modern décor with warm wood tones and red accents. Many of the design elements have been repurposed from old Victorian homes such as the pastel green chandeliers and tables made of remnants from an old bowling alley. According to owner Evan Grier, the food is best described as soul food served on small plates,and so far, the response from the community has been wildly enthusiastic with lines forming out the door on weekends. Often times, you can tell from your first bite whether you are going to experience something special and that is the case here. This is the sort of food you wish you had late at night in your fridge but seldom do. At the top of the list is their fried chicken and a biscuit ($8) made with buttermilk, cream gravy and honey hot sauce. The chicken is seasoned to perfection and the biscuit melts in your mouth. Another top seller is the strawberry bruschetta made with goat cheese, arugula, strawberries, heirloom tomatoes (in season), thyme, and balsamic reduction on their bakery-made grilled baguette. The sweet flavors of the fruits are an exquisite pairing with the slightly tangy taste of the goat cheese and the crisp bread ($8). The small plate concept is still in its infancy, especially in the Midwest, and difficult to do right. Fortunately, the team at Bourbon and Baker has gotten this down to a science and you won’t find a bad dish on the menu. If you have time for only one meal while in Manhattan, this should be it. Bluestem Bistro, situated in the bar district known as Aggieville, may look like any other number of bistro coffee houses that also serve sandwiches, wraps and salads but that’s where the similarity ends. In fact, this could probably be called the un-coffee shop as they offer upscale fare with a twist. Some of this fare includes a tangy Paleo-Diet dish: pulled pork and salad made with tomatoes, vinaigrette, a fried egg, and pickles and onions. Or there’s the featured thick crust deep dish pizza made with sausage and spinach and served with a side of honey. Bluestem is a popular hangout for Kansas State students who come here at all hours to study, socialize and share a great meal. For the late night crowd, Bluestem opens a serving window with several offerings, their latest being a waffle lolly. Picture a waffle, strawberries, cream cheese, and Nutella on a stick and you get the idea. All items are made from scratch and the quality of the food commands a loyal following. Just around the corner from Bluestem and owned by the same group, Varsity Donuts operates out of a converted historic building and features a variety of freshly made, creative confections. Since purple is the color of the local football team, the Wildcats, one of Varsity’s specialties is the K-Stater, a raised donut made with purple and vanilla frosting and purple sprinkles ($.89). Other flavors include maple bacon, red velvet and peanut butter and raspberry jelly. Between the hours of 10 pm-2 am, hungry bar hoppers can satisfy their cravings out back at the Varsity Truck with corn dogs, glazed donuts and the highly coveted mac and cheese sandwich consisting of house-made mac and cheese and bacon grilled into a cheesy, gooey sandwich for $5. You probably have never heard of a state university having a dedicated, on-campus ice cream shop but that is exactly the case at Kansas State University. The Animal Sciences and Industry building in Call Hall is home to some of the coolest ice cream concoctions you will ever taste. The secret to their success seems to be that the milk and cream come from their herd of 260 cows and the dairy product is processed and converted into ice cream in just a few days. This combined with a high butterfat content (16%) results in a smooth, rich and creamy product that has not just students but people in the community buying it by the gallons. Call Hall currently offers 40 flavors, and not surprisingly, simple vanilla is one of the most popular. Having recently re-opened in downtown in January 2014, the family run Della Voce has utilized the best of its predecessor’s Italian menu combined with made from scratch world cuisine created by executive chef Mariel Edwards. Della Voce has a full bar menu with some interesting bitters and spirits as well as a full lunch and dinner menu with entrees such as pork tenderloin medallions, roasted Yukon potatoes and sweet pea puree in a beurre blanc sauce, $24. For a city of its size, Manhattan has a wide variety of independent restaurants including the New Orleans-style Creole restaurant, Hibachi Hut. The history behind Hibachi Hut goes back at least 50 years when it was originally started by a retired army sergeant who wanted to serve hibachi grilled hamburgers the way he had seen meat cooked in Japan. For decades, Hibachi Hut was a beloved fixture of the community and when it eventually closed down, local business owners decided to reclaim its heritage, purchase the restaurant and relocate it to downtown. Many of the original fixtures, paintings and booths were preserved, thus keeping a Manhattan tradition alive. Today, you will find many of the same circa 1959 items such as Belly Bomb hamburgers together with Creole-inspired menu items like the Big Easy (seared pork belly, blackened and served with Cajun BBQ sauce, sautéed mushrooms, bell pepper, and a fried egg), po’boys, red fish, and gumbo. Owned and operated by a husband and wife team, one side of this eatery is a wine bar run by Scott Benjamin and the other side is 4-Cakes, a bakery run by his wife Rachel. The restaurant features small plates and dinner entrees that can be paired with the vast selection of more than 800 wines, neatly stacked against an illuminated green wall. If wine doesn’t happen to be of interest, also offered are their specialty—classic, pre-prohibition cocktails made with precise measurements. Some of the more popular libations include the Old-Fashioned, the Sidecar, gimlets, and the aptly named Manhattan. For dessert, many choose one of Rachel’s signature cupcakes like orange cream, chocolate stout, white wedding, or spiced carrot. When owners Kurstin and Kevin Harris wanted to open a breakfast place in downtown Manhattan, they were going to call it something other than The Chef, the former restaurant’s name in the same location. However, many residents were used to the name, and when Kurstin found the original neon sign in a museum, she decided to acquire it. Today, people line up under The Chef’ssign on South 4th Street for up to 1 ½hours to satisfy their Kansas appetites at one of the best spots in town for breakfast and lunch. The interior is decorated in bright and cheery tones of purple, yellow and blue with colorful accents throughout. The food is impressive, pushing the limits beyond the typical eggs Benedict with their own reinvented version called smoked salmon Benedict (house-smoked salmon, dark rye toast and poached eggs with home-made hollandaise sauce). One of their most popular dishes is the three egg Buenos Dias Frittata made with chorizo sausage, pico de gallo and Jack cheese and served with chipotle sauce, sour cream and home-style potatoes. This dish was named the Best Breakfast in Kansas by Food Network Magazine. 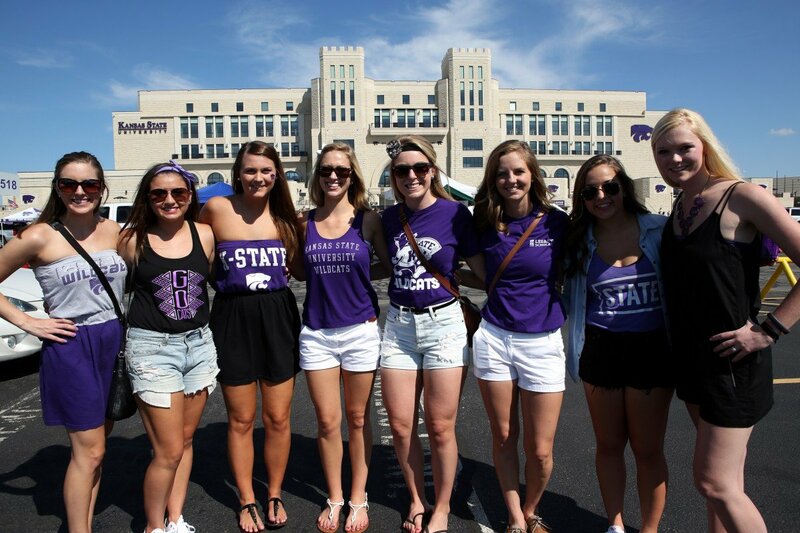 With a fun, festive atmosphere, Coco Bolo’s is the place to eat before or after a football game at K-State. Serving cantina food with influences from the islands, Coco Bolo’s has a huge variety of dining options. Favorites include the al fresco salad (grilled chicken, smoked shrimp, pico de gallo, and guacamole on a bed of fresh greens, $9.99). The wood-fired grill in the open kitchen provides the smoky flavor to many of their dishes and red chili is the base for many seasonings. One of the most popular is the Gulf Trio Mixed Grill made with Jamaican jerk chicken, Cajun BBQ pork loin filet and Caribbean bacon-wrapped shrimp served over Taters las Cruces with fresh sautéed vegetables, $18.00. There are no stingy portions here and many are large enough for two people to share. If you love food that is laden with flavor and a little heat, then Coco Bolo may be your next favorite Manhattan restaurant. This is a K-State themed restaurant located in a strip mall near the college. A glowing neon sign advertising a foot long hot dog provided the inspiration for their Nathan’s foot long chili cheese dog. Wash down the famous Coney Island all beef hot dog with beer, cocktails or soft drinks. The Meet Me in Manhattan Pizza is another menu item that locals and tourists seem to love since it doesn’t taste like a typical pizza. Topped with La Fontanella pizza sauce, four Italian cheeses, pepperoni, house-made Italian sausage, bacon bits, and honey pit ham, the pizza is stone-fired until hot, crispy and brown. Many consider this the ultimate pizza in Manhattan, Kansas. This micro-brewery opened in town in 1995 and has become the top spot for some of the best meat and steaks in Kansas. Unlike other restaurants that promote Angus Beef, Little Apple goes well beyond that with CertifiedAngus Beef. The subtle distinction between the two is a world of difference in sourcing, taste and quality and only the strictest standards apply to Certified Angus. The restaurant has received accolades and has been recognized four times with the highly coveted Kansas Beef Backer Award. They are also a big supporter of the farm to table movement and use locally sourced products grown and raised by known producers in and around the region. If you haven’t ever tried Certified Angus Beef, you haven’t really had steak. Harry’s is one of the premiere fine dining restaurants in Manhattan and has been pleasing customers from as far away as Kansas City for 24 years. Located in the historic Wareham Hotel, Harry’s has won many awards over the years, including being featured in Midwest Living, Travel + Leisure and OpenTable’s Top 100 Overall Restaurants of 2011. Much of the hotel’s original architecture has been preserved, including the expansive marble floor, crown molding, intricate woodwork, and many of the lighting fixtures, all of which add to a unique dining experience. According to owner Evan Grier, the most requested appetizer is their unique bruschetta. Thin strips of French bread are arranged into a triangular log cabin pattern and paired with finely chopped, herbed Roma tomatoes; marinated goat cheese and green olives ($18). Grier states that this is so loved that he would be run out of town if he ever dropped it from the menu. Harry’s offers a wide selection of entrees, including their bacon-wrapped filet mignon served with herb butter and accompanied by roasted garlic mashed potatoes— always a popular choice for hungry meat loving patrons ($34 small, $43 large). Owners Bud and Bob (who also own Coco Bolo’s), are long-time restaurateurs and foodies, and their earliest memories are growing up in the South and learning how to cook barbecue as well as other foods that they grew to love. Having either cooked in or experienced the four regions of BBQ (Texas, Carolina, Memphis, and Kansas City), Bud and Bob decided to offer all four styles and sauces in their retail location on the east end of Manhattan. Here, you can smack your lips on smoked brisket, turkey, pulled pork, chicken, and Texas sausage. They also happen to be huge K-State fans, and before each game, they haul out their gigantic smokers adjacent to the Bill Synder Family Football Stadium. They then set up in a designated area known as Cat Town near thousands of other tailgatersfor a humongous food for all. Football is serious business in Manhattan and so is BBQ. Each of their smokers holds 1,000 pounds of meat, which they proudly offer to their hungry and loyal fans. This newly opened center in the heart of downtown Manhattan showcases the the Flint Hills of Kansas and the Osage Hills of northern Oklahoma. Using a variety of exhibits, interactive displays and multi-media, the center is a first rate facility showcasing the last contiguous stand of tallgrass prairie in North America. There is only about 4% of tallgrass prairie left in North America, and not surprisingly, it is also one of the most endangered ecosystems. The discovery center helps educate locals and visitors about these fragile lands using a variety of educational programs designed to encourage conservation and exploration of the Flint Hills. Back in the 80s, you couldn’t give away K-State Wildcat tickets. In fact, the joke was that if you left a couple of free tickets on your windshield while you went shopping, there would be a total of four when you returned. That was then. Enter in 1989 Coach Bill Synder, who slowly started turning things around. Like the coach played by Gene Hackman in the basketball movie Hoosiers, coach Synder did more than just teach his team how to win; he also instilled values. Today, Coach Snyder is beloved by his players and community, who went so far as to name the new stadium in his honor. The Wildcats are now nationally recognized, and on game day, the town turns into a purple colored extravaganza in support of their players and college. While driving across I-70, many may miss the turnoff that, like the yellow brick road, leads to someplace special. Manhattan could very well be considered the best new foodie town for 2014. Prepare your appetite and taste buds for a mouth-watering experience in the heart of the Midwest.